I let my daughter talk back. In fact, I encourage her to talk back. Talk back is not the same as back talk. Back talk is rude or cheeky remarks made to parents. Back talk is usually the result of parents not listening. She learns to express her disagreement without using any insult or attack. Just calmly and respectfully state her objection. Because I respect her and her opinion, she learns to respect me! She’s never been intentionally disrespectful to us. Even when she sometimes displays seemingly disrespectful behavior, that’s because she doesn’t know that is disrespectful (she’s 4yo). I just need to point this out to her and she won’t do it again. 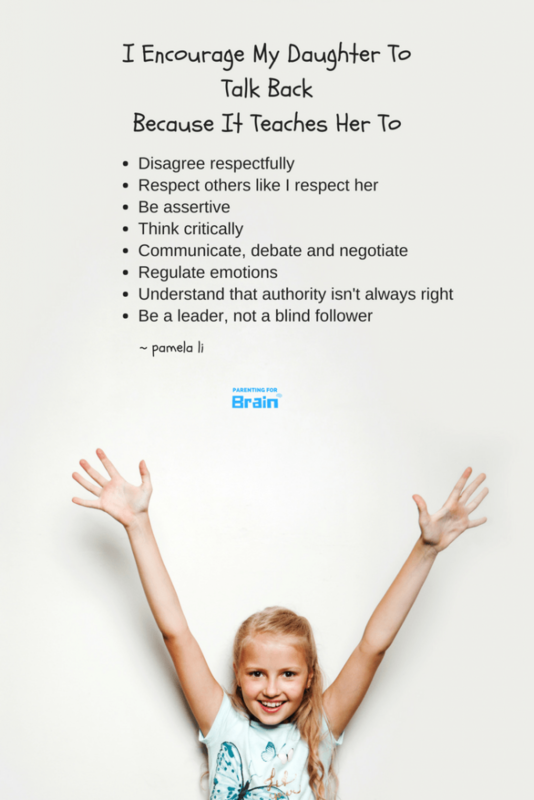 It is important for kids to learn to be assertive, but even more so for a female to learn this and not be afraid to speak up. If she has good reasons, I can change my mind about my decision, too. If not, I tell her why. She learns to think about an issue from multiple angles. And for me, hearing her side of the story also allows me to understand things from her perspective and things that I may have forgotten to consider. When she knows my reasons, I encourage her to come up with a solution that will make both of us happy. She becomes so creative that it can happen more than you think. Anger usually results when people, kids or adults, feel that something is wrong or unfair. Letting her think through the reasons helps her understand why I say/do certain things. With understanding, she learns to think about a problem instead of letting her emotion run the show. Parents are not omnipotent. I make mistakes, too. Just tell me and I can apologize or reverse my decision. I teach her not to accept something just because a certain person says it. I encourage her to use her own intelligence to judge. Basically, be a leader, not a blind follower of parents’ commands. Forgot one big advantage: we have great relationship because I’ve always treated her as an equal and rational human being. Of course, I don’t know whether this will last. Maybe in the future, she will come up with something I absolutely hate but cannot refuse. Ask me again when she’s a teenager. What controversial advice have people given to their children? originally appeared on Quora – the place to gain and share knowledge, empowering people to learn from others and better understand the world.